Nichole Ward told the New York Times that she did this experiment for her microbiology class. (I reached out to Ward for more details, but she didn't respond before publication time.) It's a pretty classic lab experiment: open up a Petri plate pretty much anywhere in the world and you'll end up with some kind of microbes that will grow when you incubate them at warm temperatures in the lab. But that doesn't mean there's anything wrong with the hand dryer. "You've got microbes all over your skin, but that doesn't stop you from holding hands," says Mark O. Martin, a microbiologist at the University of Puget Sound. "I can't tell you how many you have in your mouth, but you still kiss people. We're swimming in a sea of microbes at all times, and that's fine." The species on Ward's plate look like they could be fungi, which Martin says makes sense because lots of fungal microbes make spores that survive dry air. Ward says she used SabDex agar plates, which are listed on one supplier's site as "for the cultivation of yeasts and molds." Different types of plates would have revealed different microbes, and some microbes won't grow on a plate at all. If you really want to understand whether hand dryers expose us to harmful microbes, you would have to identify those microbes, and compare what you find there to what you find on paper towels and their dispensers, and to what is just present in the air in the bathroom. After all, toilets spray microbes when they flush, and we kick up dust from the floor when we walk. We are all surrounded by a cloud of microbes wherever we go, so if you want to avoid germs you'd also have to avoid people. Don't, though. Not all microbes spread disease. "Pathogens are kind of the juvenile delinquents of the microbial world," says Martin. "They're very low in number but they get all the press." 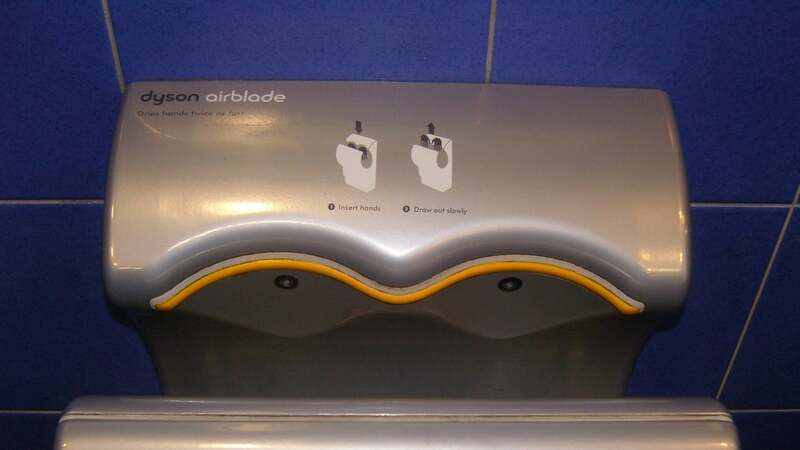 A Dyson hand dryer requires no physical contact with the machine.